Murray County Sole Commissioner Greg Hogan has a message about the place he’s spent his entire 55 years of life. “Murray County is open for business,” Hogan said. That’s in reference to the Appalachian Regional Port, an “inland port” under construction on 42 acres in Murray County on U.S. Highway 411, just north of the unincorporated community of Crandall. 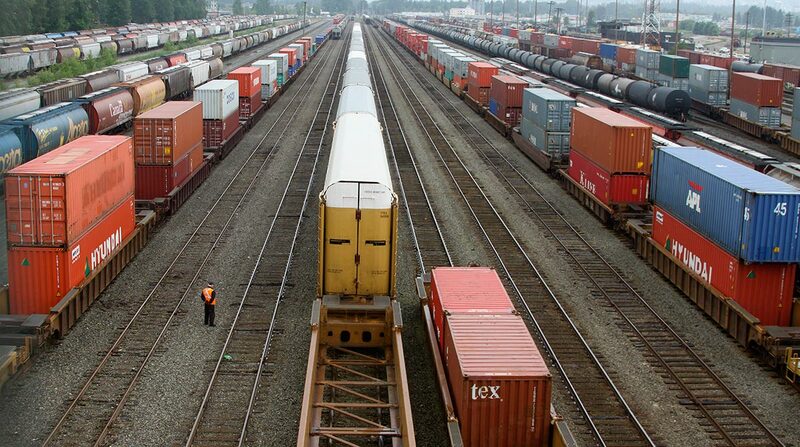 Shipping containers will be transferred from railcars to semi-trucks — and vice versa — after the port opens in October 2018. The shipping containers will arrive in landlocked Murray County after a 388-mile trip by rail on CSX Transportation tracks from the Georgia Port Authority’s Garden City Terminal, just northwest of Savannah. But the lawsuit never materialized, and Hogan said residents of the rural, sleepy county of about 40,000 look forward to the jobs the inland port could bring. Factors have aligned to make the port seem like a promising business proposition for Murray County. The shipping industry is rebounding from a number of bad years, the Panama Canal has been widened to allow passage of huge, so-called Neopanamax ships making deliveries from such places as China and — even though a dredging project to deepen the Port of Savannah isn’t finished — some of those big ships are delivering their cargo there. “We’re already receiving the bigger ships; they just have to wait until high tide,” said Ryan Macdonald, the Georgia Port Authority’s manager of strategic operations and planning. Shipments to the Port of Savannah are at an all-time high, and Macdonald expects the 1,200-acre Port of Savannah eventually will overtake New York City as the East Coast’s busiest shipping port. “We’re the fastest-growing port in the country,” Macdonald said. When the Appalachian Regional Port opens, it should do about 35,000 “lifts,” or transfers between truck and train, in its first year, he said, and reach full capacity of 50,000 lifts by year three. The inland port eventually could be expanded, Macdonald said, but it will stay within its 42-acre boundary. The inland port has agreed to suspend its operations on Sunday mornings and Wednesday nights for the Fairy Valley Baptist Church across the road, Hogan said. Georgia already has a number of intermodal ports that serve most of the state. The Murray County facility will be used by businesses in northwest Georgia, northeast Alabama, eastern Tennessee, western North Carolina and even a chunk of Kentucky. Chattanooga companies expected to use the port include Volkswagen, Wacker and Amazon, Macdonald said. Regional users of the new inland port may include flooring manufacturers in the Dalton, Ga., area, the Toyo Tire plant near Cartersville, Ga., and a Lowe’s home improvement distribution center near Rome, Ga. In anticipation of the economic development that the inland port could bring, Murray County recently created a new full-time job for Illya Copeland, who started work about three weeks ago as the executive director of two separate authorities: the Murray County Industrial Development Authority and the Development Authority of Murray County. Copeland, who previously was executive director of the Joint Development Authority of Jeff Davis County, Hazlehurst and Denton in south Georgia, is already getting calls from businesses interested in opening in Murray County. “Really, right now, we’re getting a lot of tire-kickers,” he said. Copeland also is looking at potential sites for industrial parks, which Murray County currently lacks. One industrial park could go near the inland port, he said, and another, separate industrial park site could be built for businesses that wouldn’t need close access. Copeland thinks the Appalachian Regional Port could bring more residents to Murray County — and with it more retail development. In the meantime, Copeland keeps his cellphone with him around the clock to field calls from businesses that want to move to Murray County.